Europe can no longer rely on the United States to protect it, German Chancellor Angela Merkel said Thursday, urging the bloc to take its destiny in its own hands. "It is no longer such that the United States simply protects us, but Europe must take its destiny in its own hands, that's the task of the future," she said, after US President Donald Trump left traditional allies scrambling by ditching the landmark Iran nuclear deal. A year after he took office, Emmanuel Macron voiced his impatience at a Germany that has so far proved resistant to his flagship reform proposals for the eurozone including a common finance minister and budget to drive growth. Meanwhile, France's President Emmanuel Macron on Thursday pressed German Chancellor Angela Merkel to move decisively and quickly on reforming the European Union, saying the bloc's biggest economy must look past its "fetish" for surpluses and bring about change at a critical juncture. A year after he took office, Macron voiced his impatience at a Germany that has so far proved resistant to his flagship reform proposals for the eurozone including a common finance minister and budget to drive growth. 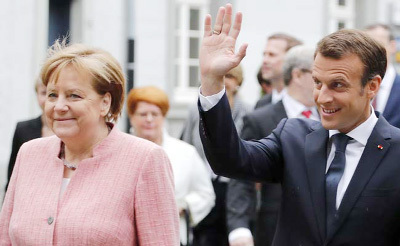 "Don't wait, act now," he said in an impassioned plea to Merkel, who was in attendance at the award ceremony in Aachen where the French president received the prestigious Charlemagne prize for his efforts in boosting EU integration and cohesion. At a time when the United States is going its own way in ditching the Iran nuclear deal and the Paris climate accord, as well as threatening allies with punitive trade tariffs, Macron said Europe needs more than ever to stand united and show greater strength. "If we accept that other major powers, including allies, ... put themselves in a situation to decide our diplomacy, security for us, and sometimes even make us run the worst risks, then we are not more sovereign and we cannot be more credible to public opinion," Macron said, in a clear attack against US President Donald Trump's decision to pull out of the hard-fought Iran accord. Trump has also warned European companies to pull out of Iran or face sanctions. But Macron urged Europeans to stand up against diktats from abroad. "Don't be weak," he said. "We need to choose, build, speak with all so as to construct our own sovereignty that will be the guarantor of stability in (the Middle East), stressed Macron. Merkel too underlined that Europe can no longer count on the United States.